Light pink with deeper pink on the underside of the petals and gold anthers. medium 3" to 3 1/2"
The bloom consists of 21 to 24 petals. The plant is a profuse bloomer. The flowers fall in one piece, are long lasting, and have consistent in form. The dark green leaves average 4" x 1 7/8". The plant is suitable for landscaping and exhibition uses. 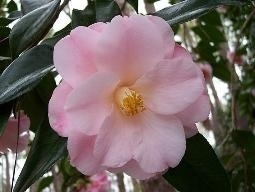 Originated, registered and propagated by Donald R. Oyler of Mobile, Alabama.